One of the easiest ways to keep a finger on the pulse of the seasons is to keep an eye on the birds. 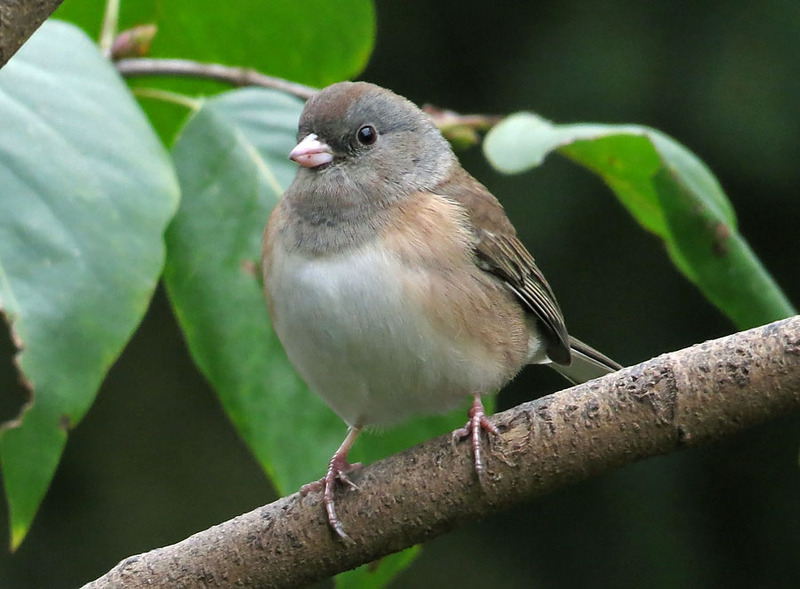 When do the Dark-eyed Juncos (like this one) return from the mountains, ready to pick up at the birdfeeder where they left off last year? When do migratory Canada Geese fly over on an autumn evening? Keeping a simple diary of the seasons can be gratifying and bring you in touch with the annual ebb and flow of nature just outside your window. Listen to BirdNote whenever you want, when you sign up for our podcast. The change of seasons lends our lives a fundamental rhythm. One of the easiest ways to keep a finger on the pulse of the seasons is by keeping an eye on the birds. As you look into your yard each day or take a favorite walk, take note of which birds happen by. When do the first swallows of spring flit overhead? 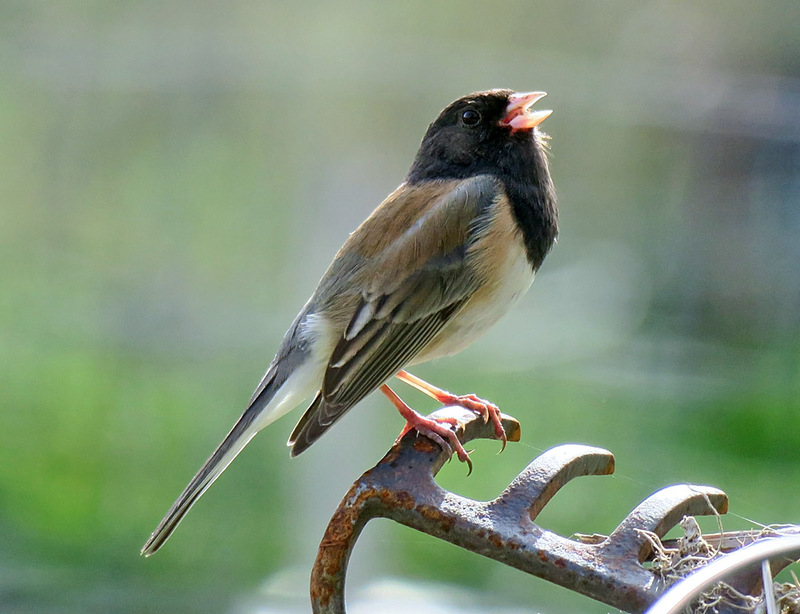 [Violet-green Swallow calls] As fall comes on, when do the juncos return from the mountains, ready to pick up at the birdfeeder where they left off last year? 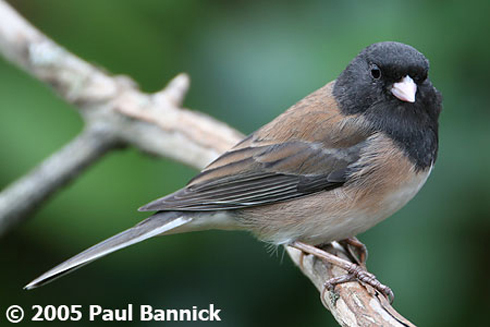 [Dark-eyed Junco trill] When do you hear migratory Canada Geese, flying overhead in the darkening autumn sky? Keeping a simple diary of the seasons can be gratifying. A blank book kept handy on the counter will suffice. The day-to-day changes you jot down bring you in touch with the annual ebb and flow of nature just outside your window. And keeping track will deepen your attunement to successive years—as a Swainson’s Thrush sings for the first time on almost the same date this year as last. [Swainson’s thrush song] Or as you anticipate the day when the chickadees will again bring their new brood to the feeder. You can get BirdNote as a podcast! Sign up on our website, birdnote.org. I’m Mary McCann. Bird audio provided by The Macaulay Library at the Cornell Lab of Ornithology, Ithaca, New York. 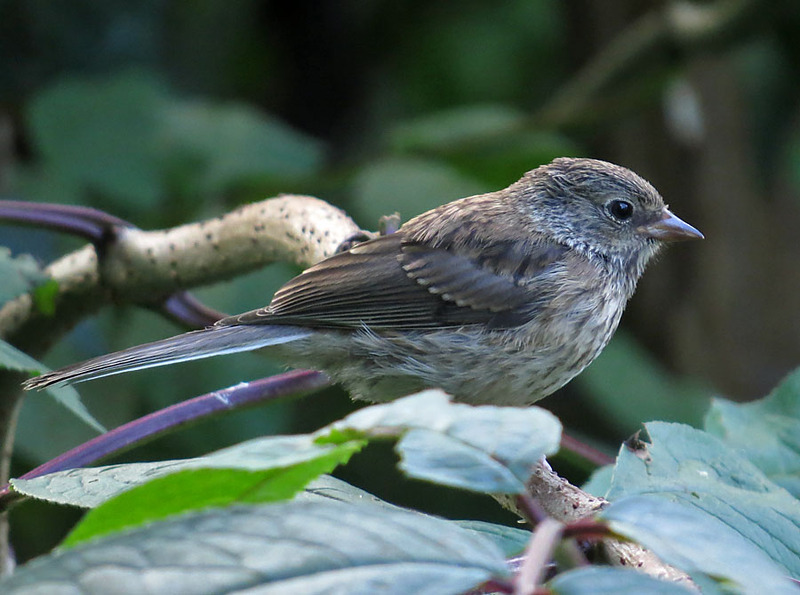 Song of the Dark-eyed Junco and Swainson’s Thrush recorded by G.A. Keller. Song of the Golden-crowned Sparrow recorded by L.J. Peyton. Call of the Violet-green Swallow recorded by R.B. Angstadt. Black-capped Chickadee call recorded by S.R. Pantle. 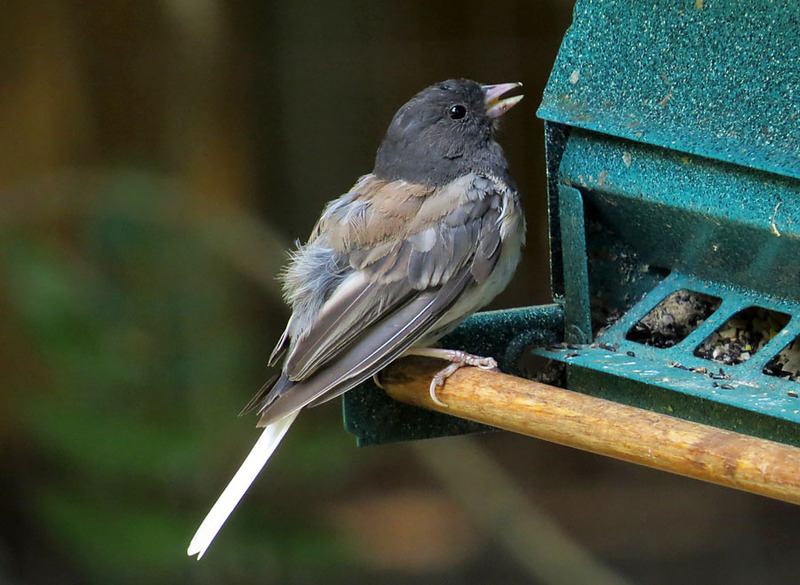 Dark Eyed Junco on Window Feeder!